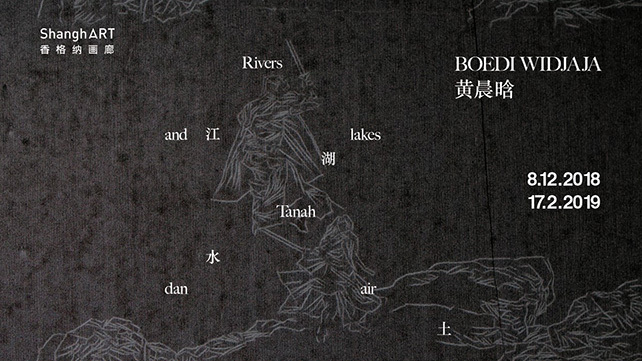 Rivers and lakes Tanah dan air by Boedi Widjaja features new and existing works from the artist’s Stone telling (2011 – ) and Imaginary homeland (2015 – ) series. The former looks at geological material transposed as marks—the artist’s proto-writing of land, water and time. In Imaginary homeland, Widjaja employed techniques of tracing, transferring and making negative images to contemplate wuxia films; a form of Chinese-diasporic cinema that he grew up watching in the 1980s. The heart of the exhibition, live art and textual work Rivers and lakes Tanah dan air, will progressively materialise in the gallery. The artist’s bilingual poem of four lines, “Rivers and lakes / Tanah dan air / Land and water / Sungai sejarah” were re-ordered in 24 permutations, creating 24 poems. Each line, consisting of geographical features and elements, contains multiple cultural associations.2 Across 8 days during the exhibition, the artist will listen and trace his father’s reading and writing of the poem in its 24 permutations; eventually covering the blank 9m wall with this repeated text-as-image. The exhibition highlights the artist’s two ongoing series and reveals his layered, processual approach to the primordial act of drawing, which includes tracing, mark-making and writing. For Widjaja, drawing is a physical activity that dilates into a metaphysical journey. Through drawing, the artist pulls at disparate materials—histories embedded in geological objects; his childhood memories; speculative origin stories constructed through myths—to re-code them into new forms and futures.